Pia Russo is a highly respected Italian ballet teacher, currently working at the Ballet School of Teatro San Carlo in Naples, one of the world’s oldest ballet schools, founded in 1812 by Salvatore Taglioni, uncle of the celebrated Maria. She is known for her passion, dedication and meticulous preparation. I immediately realised that “student Russo” would add lustre to our diploma… in her exercises, with their logic, she applies and evolves the fundamentals she learnt at La Scala, enriching them with her artistic sense and personality. From 2012 to 2016 she was the School Principal at the Tulsa Ballet Center of Dance Education and has worked as guest teacher for most of the Italian dance companies. I asked her why she became a teacher. It just happened. I was 34 and my career as a dancer was coming to an end when one of my main coaches, Valentina Massini Apostolescu, suggested that I attend the two-year teaching program at Teatro La Scala. I listened to her advice, even though at that time I assumed that I was going to start working behind a desk, taking care of the organisation and marketing aspects of dance. As I received my certificate at the end of the course, I presented a ballet training project and I was really surprised when it was approved and financed by the Veneto Region. It was my first project and I took care of every aspect of it, from putting it all together as well as looking after the economic side of things, but I didn’t teach. I hired guest teachers. I started during the following five editions of the same ballet training courses. Some of the former students still work in ballet companies in Italy to this day. I was getting some good results, and so I started being more involved in the work in the studio. I then worked as a ballet mistress in ballet companies and institutions around Italy, until I got offered a position as School Principal at the Tulsa Ballet Centre for Dance Education in the USA in 2012, and after that a position as Specialist Professor at the Burgos Conservatory in Spain in 2016. Now I have been working at the Teatro di San Carlo Ballet School since last September. Sharing. My students are young teenagers, and as such they dream, have illusions, fears and goals, continuously dealing with the mirror, and sometimes they don’t accept themselves. I believe it’s very important to share with them both group and individual goals as we progress in an environment of growth — technical and artistic, as well as psychological. I use the term artistic, but what I really mean by that is their ability to develop their own personalities within established rules and strong discipline. What do you consider to be the most important aspect of teaching? The ability of a teacher to transmit their knowledge through a dialogue that is appropriate to the various phases of the psychophysical and cognitive development of their pupils. A dialogue that never mortifies the students’ self-esteem and the passion that drives them to learn. They must face themselves, sometimes with severity, but never being belittled in their own eyes and those of their peers. It’s not easy! I struggled at first when I was in the US, having to adapt my way of communicating. Well, my tone of voice was too high in the States, and by that I don’t mean just the volume, but also the emphasis and the passion that I was accustomed to using in my work before moving to Tulsa. Now that I am back in Europe, and working again in Spain and Italy, I realise how different the situations are. There are also ways of giving corrections and relating to the students in the US that I hope I have incorporated in my teaching and will retain in the future. For example, not all corrections have to be given in front of everyone, especially those regarding discipline. I can say the same for physical proximity. Too up close and personal? The relationship with the body here in Europe is completely different in the US. They have a sense of formality and discretion that Europeans are not used to. Teaching often requires very close contact with the body, especially when fixing and adjusting a position, and this can create some problems with what Americans are used to. You need to find a good balance. What do you see as bad teaching? The aim of developing strength in the students’ legs and feet without enough work in the upper body. Also, it’s not easy to find the right balance between a clean, correct technique and freedom of movement. How difficult is it to correct a new student who is talented but has been badly taught? It is very difficult, but it’s possible. It takes time, and the pupils require great intelligence and the will to listen. It is fundamental to get rid of all those muscular tensions that derive from a bad posture and incorrect training that have become habits. What method or methods form the basis of your teaching? 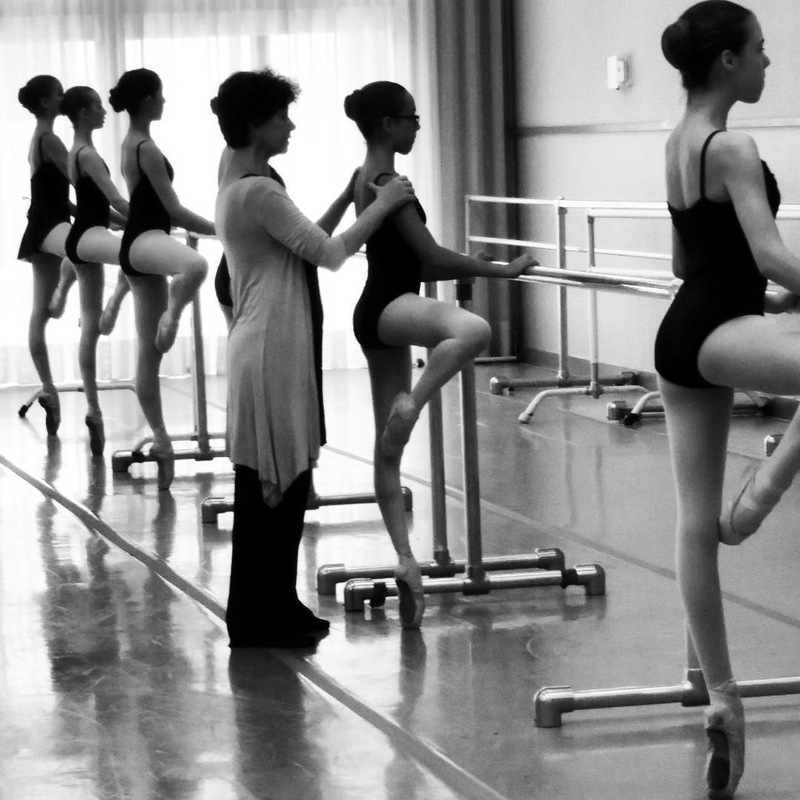 The Vaganova method. I first studied with Romanian and Russian teachers and then I went on to study at Teatro alla Scala and received my diploma (not recognized), under the guidance of Anna Maria Prina, Margherita Smirnova and Bella Racinskaja. Have other elements crept in? I have worked with Robert North and Robert Cohan — here we are obviously talking about Graham technique. They opened up a whole new world to me and they taught me a different way of distributing the body weight and of using the spine. I sometimes give my students their examples and tell them how they would describe certain sensations. Do you continue to modify your approach? I am very curious. I have seen classes at the Edward Ellison Ballet School and ABT Jacqueline Kennedy Onassis Ballet School during my time in America, and at the English National Ballet School in London and the Academie Princesse Grace in Montecarlo last year. I do hope that I will be able to visit more of these centres of excellence… confrontation is always necessary. So what do you take away from sitting in on classes given by other teachers? When I watch other classes I am very careful to observe the language that teachers use rather than the combinations themselves. Sometimes you give a correction and you don’t obtain the result you wished for, then by chance you use different words for the same correction and the result comes immediately. I get inspired by those teachers and use what worked for them in my classes. Finding the right key… can you give an example? I pay a lot of attention to the use of the upper body, posture, the placement of shoulders and shoulder blades, and obviously the port de bras. I once had a group of new students with different backgrounds and I found myself struggling to obtain the results I was striving for. It just happened that we all went to see Giselle, with Marianela Núñez, and that of course was the subject of a lot of discussion the next day in the studio. I made them notice how this great dancer “took the light from above”. It felt like I found the magic words that awoke their imagination that changed their shoulder posture. As a teacher, what gives you satisfaction? When my students become independent from me. When I can see that they have acquired a method that allows them to study and work properly, and that they will carry this with them in their career and in their life outside dance. Puoi spigarci il percorso che ti ha portato ad insegnare? Un caso. Avevo ormai 34 anni, la mia carriera di ballerina era verso la fine e una delle mie principali maestre Valentina Massini Apostolescu mi consigliò di partecipare al Corso biennale per Insegnanti del Teatro alla Scala. Segui il suo consiglio anche se all’epoca pensavo che il mio futuro sarebbe stato dietro una scrivania a occuparmi di organizzazione e progettazione legata al mondo dello spettacolo e della danza. Appena conseguito il diploma scaligero redassi e presentai alla Regione del Veneto un progetto di formazione di danza che fu con mia grande sorpresa approvato e finanziato. Era la prima edizione e ne curai anche programmazione e realizzazione sino alla rendicontazione senza insegnare. Chiamai maestri ospiti. Puoi dirci qual è stata la tua esperienza di insegnante e dove lavori ora? Iniziai a insegnare nelle seguenti cinque edizioni dei corsi di formazione approvati dalla Regione del Veneto. Alcune allieve di allora tuttora lavorano in alcuni corpi di ballo italiani. Mi sembrava di ottenere dei buoni risultati, modificai obiettivo professionale e iniziai a dedicarmi al lavoro in sala. Poi ho lavorato come maître in alcune Fondazioni e Compagnie di danza italiane sino a quando non mi è stata proposta nel 2012 la posizione di School Principal al Tulsa Ballet negli Usa e poi nel 2016 quella di Professore e Specialista al Conservatorio di Burgos in Spagna. Dallo scorso settembre lavoro al Teatro San Carlo. Come potresti descrivere il tuo approccio all’insegnamento nel rapportati con i tuoi allievi? La parola che può definire il mio approccio è condivisione. Gli allievi sono preadolescenti o adolescenti, e come tali, sognano, hanno illusioni e paure e desideri, a volte non si accettano. C’è il famigerato rapporto con lo specchio. Credo quindi sia importante condividere con loro di volta in volta gli obiettivi collettivi e individuali in una prospettiva di crescita tecnica, psicologica ed artistica. Uso il termine artistico ma intendo la capacità di sviluppare la loro personalità all’interno di canoni prestabiliti e di disciplina ferrea. Cosa vedi come aspetti più importanti nell’insegnamento? Sicuramente se riferito alle differenti età, la capacità di chi insegna di trasmettere il proprio sapere attraverso un linguaggio appropriato alle diverse fasi dello sviluppo psicofisico e cognitivo. Un linguaggio che mai deve mortificare l’autostima degli allievi e la passione che li ha spinti a decidere di studiare. Si deve metterli di fronte a se stessi, a volte anche con severità ma senza mai sminuirli agli occhi di se stessi e dei coetanei. Non è facile! Negli Usa ho fatto fatica all’inizio a rimodulare il mio modo di comunicare, dal tono della voce un po’ troppo “italiano” sino a trovare un nuovo equilibrio nella distanza/prossimità fisica con l’allievo. Esistono anche aspetti cosiddetti “culturali” È necessario capire in quale values system ci si inserisce o quali differenti values system convivono e coesistono per essere accettata e stabilire una reale comunicazione. Ovviamente la mia voce era un po’ troppo alta negli Usa. Per alta non intendo solo il volume, ma l’enfasi e la passionalità con cui normalmente comunicavo con gli allievi prima di trasferirmi a Tulsa. Me ne rendo conto adesso, dopo essere di nuovo in Europa e aver lavorato ancora una volta in Italia e Spagna, di quanto siano situazioni diverse. Ci sono comunque alcuni aspetti nel modo di porgere le correzioni e di relazionarsi con gli allievi negli Usa che spero di aver portato con me e di mantenere come abitudine. Esempio? Non tutte le correzioni, specie quelle che riguardano la disciplina devono essere comunicate in forma pubblica e collettivamente alla presenza anche degli altri allievi. Lo stesso posso dire per la distanza o la vicinanza. Negli Usa il rapporto con il corpo è completamente diverso da quello a cui io sono stata abituata in Europa. Negli Usa esistono ancora un riserbo e un senso del pudore a noi europei sconosciuti. L’insegnamento della danza spesso esige correzioni manuali, toccare gli allievi e modificarne la posizione, ad esempio. E questo in alcuni casi mal si concilia con il loro senso del pudore e riserbo. Va quindi trovata una giusta mediazione. Quale sono I più grandi errori nei metodi di insegnamento? Il puntare a sviluppare subito la forza nelle gambe e nei piedi senza dare importanza alla parte superiore. Non è facile mediare tra pulizia tecnica e libertà del movimento. Qual è la difficoltà maggiore di correggere il talentuoso ma mal formato nuovo allievo? Molto difficile, ma si può. È necessario tempo, grande intelligenza e disponibilità all’ascolto da parte dell’allievo. Bisogna saper eliminare tutte quelle tensioni muscolari che una scorretta postura e cattivo training hanno stratificato come abitudini corporee. Qual è il metodo alla base del tuo metodo di insegnamento? Come puoi aprirti a nuovi orizzonti? Incorpori elementi di altri metodi? Il Metodo Vaganova. Ho studiato prima con maestri rumeni e russi e poi ho conseguito presso il Teatro alla Scala il diploma (non riconosciuto) sotto la guida di Anna Maria Prina, Margarita Smirnova e Bella Racinskaja. Aggiungo che penso che la mia punto di forza come maestro sia il training e non l’insegnamento del Repertorio. Sono curiosa. Sono andata ad assistere alle lezioni di Edward Ellison e della ABT Jacqueline Kennedy Onassis Ballet School e quando vivevo negli Usa, e l’anno scorso dell’ENB School a Londra e Academie Princesse Grace a Montecarlo. E spero in futuro di poter aver il tempo e l’opportunità per visitare altre realtà eccellenti. IL confronto è necessario sempre. Ho lavorato con Robert North e Robert Cohan. Si parla ovviamente di tecnica Graham. Mi hanno aperto un mondo e mi hanno fatto sentire in modo diverso il peso del corpo e l’utilizzo della schiena. A volte porto agli allievi dei loro esempi, di come spiegavano alcune sensazioni. Quali nuovi elementi ha scoperto ed applicato recentemente? Quando assisto ad altre lezioni sto molto attenta non tanto alle legazioni quanto al linguaggio che I maestri usano. A volte dai una correzione e non ottieni il risultato sperato, poi per puro caso usi per la stessa correzione delle parole diverse e vedi subito il risultato. Quindi mi capita di usare le parole di altri maestri che mi sembra funzionino. Ecco un esempio. Do grandissima importanza alla parte superiore, alla postura di spalle e scapole e ovviamente ai port de bras. Con un gruppo di nuove allieve con una diversa impostazione di base stavo facendo fatica a ottenere il risultato sperato. Caso volle che andassimo insieme a vedere Giselle interpretata da Marianela Núñez e il giorno dopo ovviamente se ne parlasse in sala. Tra le varie cose feci loro notare come questa grande ballerina “prendesse la luce dall’alto”. Fu come trovare la parola magica che risvegliava l’immaginario delle allieve e faceva cambiare loro l’atteggiamento delle spalle. Quando gli allievi diventano indipendenti da me. Quando capisco che hanno finalmente acquisito un metodo di studio e lavoro che si porteranno per tutta la vita nella carriera e non solo.